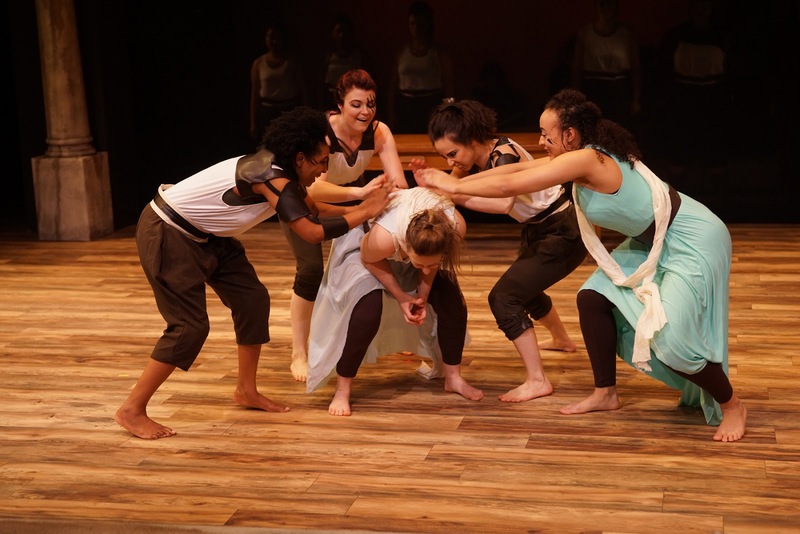 This play was created in a devised theater style, meaning that the 11-woman ensemble created the piece together, under the leadership of the director. The result is really strong, cohesive, inventive storytelling. Reprising her role from the previous iteration, Lauren Diesch is a fantastic Antigone, a true and noble hero. 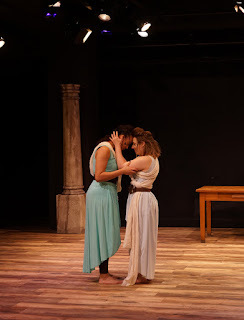 Jamilia Joiner is the yin to her yang as Ismene, perhaps not as brave but just as strong of feeling. Kelly Nelson and Antonia Perez portray the brothers who die early in the play, but return as ghosts and in flashbacks, the four creating a sweet and believable, if troubled, little family (they're the children of Oedipus and his mother Jocasta, who is therefor also their grandmother, so they've got it rough - the original soap opera). 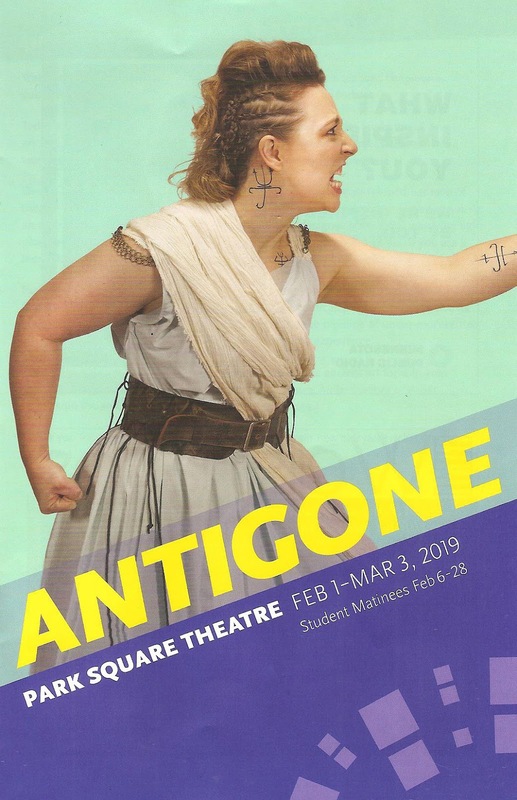 Laura Leffler is a strong King Creon, showing remorse at what he's forced to do to maintain his rule; Jamie White Jachimiec is a regal Queen Eurydice; and Vinecia Coleman is sympathetic as Haemon, stuck between his father's laws and his love for Antigone. The family has nicknames for each other - Tiggy, Issa, Cece - that helps to create that sense of familial connection. Of course, a Greek play would not be complete without a Greek chorus. In this case, Erin Farste, Kelly Huang, Meredith Kind (who also choreographed the super cool fight scenes), and Teresa Mock play the chorus as guards and other characters, adding some much needed levity as they chide each other. Another important element of the piece is the live music, provided by Sarah Modena on piano and Steve Modena on guitar and percussion, returning from the previous iteration of the show. They're credited as sound designers, which is appropriate because they create the soundscape of this world, sitting behind the sheer curtain at the back of the stage. 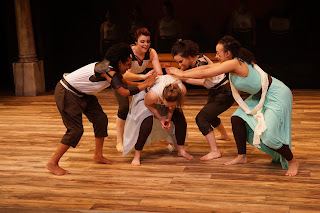 Morgan Groff's classical/modern costumes also help create the ancient yet immediate feel of the play, with draping dresses over leggings for the sisters, classic black and white for the guards, and a stunning royal red dress for Eurydice. The consistent hairstyles (fauxhawk with side braids) and facial tattoos also create a unique modern yet ancient look. The set (designed by director/adapter MJ) is simple and mostly bare, with a few time-worn Greek columns standing in back or lying on the ground, and a solid table. One of the best things to come out of the last few difficult years has been the renewed interest in women's voices and women's stories (see also: Congress). Park Square continues that exciting new tradition with an ancient woman's story, told by a group of modern, diverse, talented women who make this 2000+ year old story feel urgent, necessary, and now (continuing through March 3). *Plot summary adapted from what I wrote about the Theatre Coup d'Etat production.